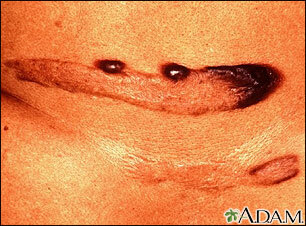 Keloids are overgrowths of scar tissue that follow skin injuries. Keloids may appear after such minor trauma as ear piercing. Dark-skinned individuals tend to form keloids more readily than lighter skinned individuals. These patches of keloid have become darkly pigmented.